More than 40 SEMA members met with their elected representatives in Washington, D.C., as part of the May 14 Washington Rally. The meetings were a valuable opportunity to urge members of Congress to pursue a pro-growth, manufacturing and job-creation agenda. Between meetings, Rally participants were treated to a unique lunchtime panel discussion hosted by “Fox News” contributor Frank Luntz, who is known for his trademark public-opinion focus groups. The mid-term elections are around the corner, and at no time in recent history has Washington been so divided. Lawmakers could not agree on how to stimulate the economy before becoming mired in the debate to reform the American health-care system. Sound familiar? That’s because you’ve read those words before. In fact, it was in these very pages just four short years ago. The times have changed, but the song remains the same. Voters are fed up with Washington. Where do things stand heading into November’s midterm elections? Let’s have a look. Legislative proposals, both beneficial and harmful, are introduced each year in legislatures all over the country. Many have a direct and immediate impact on you and your company. Targeted and timely responses from constituents like you can sway the final vote. The SEMA Action Network (SAN) gives you easy-to-follow guidance on helping affect bills related to vehicles and small business before they become law. If you have ever wondered what the difference is between a trademark and a trade secret, you are not alone. Most of the terms used to describe different types of intellectual property (IP) are commonly thrown around interchangeably. However, to protect the IP rights of your company, it is important to take a moment to review the basics of trademark, patent, copyright and trade secret law we have compiled below. Many lawmakers are big fans of collector cars, vehicle exhibitions and auto racing. One of the biggest is West Virginia Delegate Gary Howell. As a SEMA member and owner of Howell Automotive in Keyser, West Virginia, Howell has consistently demonstrated his desire to keep the laws in his state hobby-friendly while representing his constituents in the state legislature. He has worked extensively in the motorsports industry, raced both stock cars and drag cars, built winning race cars and award-winning show cars and designed racing parts. He has also hosted a syndicated radio show, written automotive magazine articles and served as a technical expert on automotive TV shows. Exhibitors have a valuable opportunity to generate excitement for their participation in the 2014 SEMA Show through the Online Media Center. As the Show gets closer, reporters routinely search for updates from SEMA Show exhibitors. News regarding new products, changes to signature lines, booth demonstrations, project-vehicle reveals and celebrity appearances are a few examples of the Show-related news circulating prior to the event. New product launches for Adenna, Brake Performance, Sean Hyland Motorsport, Custom Autosound Mfg., and TruXedo. You might be able to start a nail with a screwdriver, but it’s a whole lot easier with a hammer. The proper tool makes any task flow more smoothly—and automotive machining and modification are certainly the beneficiaries of tool and equipment innovations. 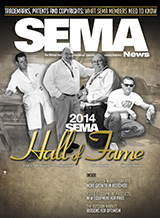 A wealth of working gear was introduced in the New Products Showcase at the 2013 SEMA Show. We’ve gathered them together on the next few pages for your review and enjoyment. There may be a gem here that can make your next undertaking more of a joy and less of a job. Off Road Warehouse (ORW) has been in business for more than 43 years. Off-road enthusiast and desert racer Howard Hughes (no relation to the business magnate and aviator) founded the company when he tired of having to get parts through mail order and recognized that others who raced and off-roaded felt the same. He started with a small location in a suburb of San Diego, California, and eventually opened two more stores in the area.